In providing mobile water treatment systems, service is at the very core of Ecolutia. Flexible solutions reflect the passion for achieving excellence in customer service, whilst also providing superior and efficient mobile water treatment systems. Ecolutia recognise the need for COMPLETE solutions and that service goes very much hand in hand with the equipment provided. Ecolutia’s mobile water treatment systems are operated and maintained by university graduated Field Service Engineers (FSE’s), who are a big part of Ecolutia’s service philosophy. Not only university graduates, but also graduates of Ecolutia’s challenging internal training programme, they are committed to meeting Ecolutia’s high standards. Supporting them is a team, who are also graduates of Ecolutia training, and are spread around the globe, available to help 24 hours a day. They provide the FSE with any technical or customer back up support that may be needed. 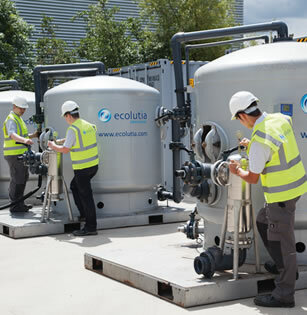 Just like our mobile water treatment equipment, our people are ready to go where you need them, when you need them, to provide the superior solution that Ecolutia delivers. In line with this thinking there are many ways in which you can choose to work with Ecolutia. The following categories roughly group the service options available, but be assured Ecolutia’s flexible approach means you will find a route that will work best for you. Some detailed examples of applications of Ecolutia’s mobile water treatment systems can be found in the user section of this site. These vary in the type of response they have required but a rapid response is included amongst them. Login here for access. You will be asked to register, should you not have done so already, but in line with Ecolutia’s service philosophy this can be done instantly for prompt access. Call Ecolutia should you wish to discuss having an emergency mobile water treatment plan in place. We are open 24 hours a day, 365 days a year. Some detailed examples of applications of Ecolutia’s mobile water treatment systems can be found in the user section of this site. These vary in the type of response they have required but a short term/temporary application is included amongst them. Login here for access. You will be asked to register, should you not have done so already, but in line with Ecolutia’s service philosophy this can be done instantly for prompt access! Should you wish to discuss having a short term or temporary contract these can be agreed well in advance or also at short notice, subject to our mobile water treatment systems availability. Call us to discuss the best solution for you. In the same way that Ecolutia can offer immediate short term or emergency solutions, customised solutions can be designed, installed and operated for projects lasting anywhere from 1 to 15 years and beyond! Often referred to as BOOM (Build, Own, Operate, Maintain) projects, they offer a complete ‘hands-off’ solution. These can often be applied for supplementing existing plants or for new/replacement projects. Customisation of the modular mobile water treatment equipment can achieve a system that supports individual customer demands; and back up equipment from the mobile fleet allows treatment flexibility and peace of mind throughout the extended term of the BOOM agreement. Contracts are negotiated on an individual basis and cover all elements of the BOOM process. Call us to discuss a long term contract that would work for you. However you choose to work with Ecolutia, you can be guaranteed that customer service and systems excellence is at the forefront of everyone’s mind.